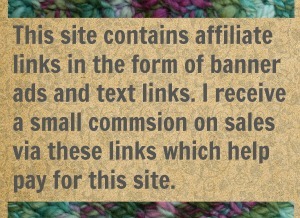 Welcome to the second post in my campaign to promote beadwork in yarn-y things! When it comes to embellishing your knitting and crochet, beads are perhaps the easiest option. I’m always surprised that more crafters aren’t adding beads for that little “extra something”. But then I’m always surprised when a designer publishes a pattern with optional instructions for adding beads because… beads are always an option. To set a bead as you work means that you will be coaxing a bead onto one of your live loops. You’ll pull your hook out, set a bead so that it sits down at the base of your active loop, and then put your hook back and go on. 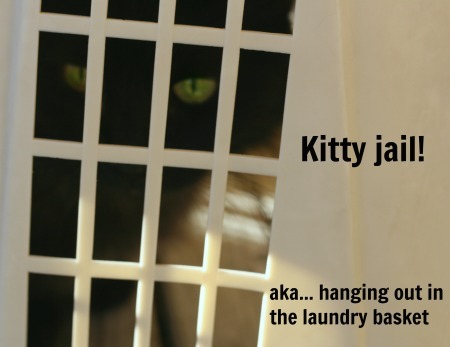 The trick is getting that bead on your active loop of yarn. For that you’ll need an extra “tool” of some kind. In the video below I demonstrate how you can get this done with a tiny (we are talking really tiny) crochet hook, or with a dental floss threader. I know that many crafters like to use dental floss but not me. Floss threader is easier to use, its very cheap, its sold in packs of 20 or more, and I find it to be far less fiddly then using lengths of dental floss. But if you like to use the actual floss, that’s great. Any method you come up with to get that bead on the active loop will work just fine. In a pinch I’ve stripped bread ties of their plastic coating, bent the wire in half, and made it work. Here is me using a tiny crochet hook to set a bead. The hook has to be small enough to go through the bead. Then you use the tiny hook to grab the active loop of yarn, push the bead down the loop, and remove the tiny hook. For this tutorial I’m using a size 4/0 bead with a 1.4 mm hook. Floss threader is small enough for almost any size bead. That’s nice. Its also easier to find and buy then a whole collection of tiny steel hooks in various sizes. (Its at the grocery store next to the toothpaste). You push a bead on to the threader, insert the threader into the active loop, bend the end of the threader back and into the bead (its very flexible), and push the bead down o to the active loop of yarn. And here is me doing all of that on video. The video does not have the close-up resolution to see the details of what is going on, hence the pictures above. But sometimes its helpful to watch the motions, to see it happen in action. Hence the video below! 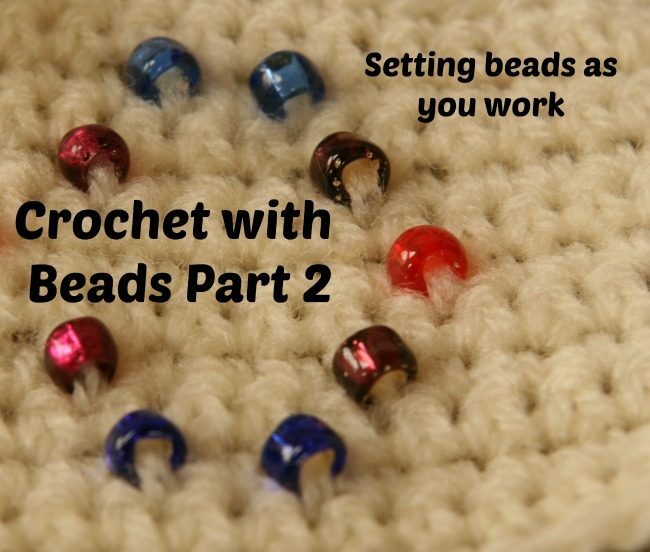 Hopefully between the two, you’ll be setting beads in all your crochet stitches. 2 Comments on "Beadwork in Crochet – Part 2"
I’m in love with my Beadle Needle personally… but I tend to pick hard patterns anyway and the order of what colored beads matters. So I like being able to preload a few rows at a time 🙂 It’s a great little gadget, and how doesn;t need more yarny gadgets? I hear that! The one with the most gadgets and tools wins.